There are a lot of options for treating the symptoms of an infection, such as pain, swelling, or fever. But if you don’t eliminate the infection, the root cause of those symptoms, treating the symptoms is only a temporary relief. Some preppers have explored the option of fish antibiotics in a survival situation as a last resort option. I have young daughters still at home, one of whom is prone to respiratory infections and being able to treat her if she gets sick in a SHTF situation is one of my main concerns. So, although I’ve also research natural treatments, I did some research and ordered a bottle of fish antibiotics, cephalexin (Keflex). I had planned to order several other kinds later on, but I started with cephalexin. It arrived, and I added it to my SHTF stockpile of supplies and didn’t think much more about it. But just a few days later, I had the opportunity to test it out those fish antibiotics on a tooth infection. I’m going to share that experience with you along with some other good information to know about fish antibiotics for survival. My tooth had been aching something fierce for about three days or more and like the big baby I am when it comes to dentistry, I was putting off getting it taken care of even though I KNOW that it can lead to more problems if I put it off. We don’t always do what we should, do we? Well, the entire left side of my nose and cheek swelled up virtually overnight from this toothache. Funny thing was, with the swelling there, the pain of the toothache was gone. But my children were freaked out because I looked really horrible with half my face swollen. A relief and not a relief at the same time. Since my fish antibiotics had arrived by chance just a few days prior to that, I looked up recommended dosages for severe infection and started taking them. I figured the only way to know if fish antibiotics would really work in a survival situation, would be to try them now. And I’d rather experiment now then wait until SHTF to find out fish antibiotics don’t work. Plus, waiting till SHTF to try them meant taking the additional risk that one of us could have an allergic reaction to the fish antibiotics without professional doctors available to help. Since I’m a single mom, I cannot afford to check out during a SHTF event because of an allergic reaction and I certainly don’t want to inadvertently kill one of my children while trying to heal them of an infection. I told my family what I was doing before I started taking them, just in case something quirky went wrong and I needed professional medical attention. The first day, my face continued to swell, and I was a bit nervous to go to bed thinking that my eye would be swollen shut when I woke. As expected, when I woke the next morning, my face and my eye were really swollen from the infection, but I could still see. Still no pain. I continued the antibiotics and I started drinking a lot of water. It was a Saturday morning. I decided if the swelling didn’t start going down by the next morning, I was heading for the urgent care. Trust me, I wasn’t looking forward to having to tell the doctors that I had taken “fish antibiotics”. I could anticipate the looks between staff as if deciding whether I was crazy and should be committed somewhere. By Sunday morning thankfully, the swelling had gone down considerably. There was just one little puffy place under my eye. But unfortunately, with the swelling down, the pain of the toothache was returning gradually. Not good. But the dosage recommendations on the fish antibiotics said to take for 7 to 14 days, so I kept taking the antibiotics. And a few days later since I still had pain and symptoms and it had only been 7 days, I decided to do 14 days total instead of stopping at 7 days. By the time the 14 days was up, the swelling had been completely gone for almost a week. The pain from my toothache had subsided completely at around the eleventh day. But I continued to take them to the fourteenth day. Now, at least I know when SHTF, and dentists aren’t accessible, what I have stored will work on tooth infection at least. I’m NOT a physician and I’m NOT recommending that anyone experiment on themselves. And it would be better to have the antibiotics analyzed first. I always recommend anyone changing medication does so under a doctor’s supervision. But I researched this subject for nearly a year. I had several referrals from other people who had success with this company, and I did my research on what I bought. I felt confident I had gotten something that although it may not help the infection, it wasn’t going to physically harm me. And I had absolutely no other health issues going on. Although I must admit, it was a bit scary taking something unknown. I have since bought quantities of other fish antibiotics from the same company to have on hand for different types of infection if SHTF. It’s now been more than a year and I’ve had no ill effects to my knowledge from taking the antibiotics. Again, this is my story and not medical advice for your situation. Make sure you are certain about the difference between animal dosage and human dosages. Remember that animal antibiotics are designed to work on the body type of the animal it is made for and this can impact how well it works or doesn’t work for humans. Know what it is in the fish antibiotic to be sure that you do not have a known allergy to its listed ingredients. Fish antibiotics and other drugs for animals can have additives fillers, and other things that are prohibited in human antibiotics. The only way to be certain is to have the antibiotics you choose analyzed to identify additional ingredients. Pharmaceutical Grade is a completely made-up term or phrase some people and companies use to imply that fish antibiotics are suitable for humans. USP Certified refers to the United States Pharmacopeial Convention. They set guidelines for drug quality in regard to how pure it is, how it should be stored, and its strength. USP certified does not mean that drug is effective or safe for humans. FDA Approved for animals doesn’t automatically mean FDA approved for humans. What about the expiration dates on antibiotics? If you’re going to store your antibiotics, you definitely want to know that when you need them in a SHTF situation, they’re still going to be effective. Most antibiotics have a manufacturer’s expiration date which is on the packaging that arrives at the pharmacy and a pharmacist’s discard date which is labeled by the pharmacist at the time they dispense it to you. The good news is that most antibiotics do not become toxic because they are outdated. Tetracycline is one antibiotic that is dangerous if it is outdated, it can damage the liver. But one thing to be aware of with outdated antibiotics is that the allergen strength can increase over time, especially in drugs such as cephalosporins and penicillin. This means if you do have an allergic reaction to the drug, it could be more severe and even fatal. In a survival situation, a severe allergic reaction is a very serious risk, because professional medical treatment may not be available, or the response time of emergency personnel will be extremely delayed and unpredictable. But one of the biggest dangers of using antibiotics that are outdated or “old” is the fact that many antibiotics lose their potency over time. Now you may be thinking this is no big deal, right? It’s a little less effective but that’s not going to kill me. However, it is a big deal. In fact, taking an antibiotic that has lost its potency can actually have serious consequences and can even be fatal. One of the huge risks associated with taking an antibiotic that is outdated and has lost its effectiveness is that the dosage of the antibiotic is then no longer adequate to completely eradicate the infection. So, essentially you would be doing the same thing that some people do when they take antibiotics just until they feel better and symptoms go away and then stop taking them. You may feel better and be out of danger for the immediate future, but you run the risk of having that infection, now resistant to that antibiotic, hiding dormant in your body. This is why it’s critical to have your animal or fish antibiotics analyzed to make sure they contain the medication you believe they do at the level you believe is there. Because if your antibiotic has lost its potency or if your fish antibiotic is really corn starch in a lookalike capsule with say half the amoxicillin mixed into it, then the next time that infection rears its head, 3 months, 6, or even a year from now, that antibiotic may not have any effect at all. When this happens and medical treatment is available, doctors prescribe a different antibiotic or a stronger one that usually does the trick. But in a survival situation, you may not have that luxury. So, if you’re going to stockpile antibiotics of any kind for survival, then pay attention to the manufacturer’s expiration dates and that you are storing them properly, so they don’t break down too early. Did you know that your bathroom medicine cabinet is one of the worst places to store your medications? Humidity is a huge enemy when it comes to proper storage of medications, including fish antibiotics. Below are some additional tips on how to store fish antibiotics for survival. Keep at room temperature (between 59 and 86 degrees Fahrenheit, that’s 15C – 30C). This includes temperature during shipping also. Store medications in airtight containers. Make sure your packaging cannot leech into the pills or the pills leech into the plastic packaging. 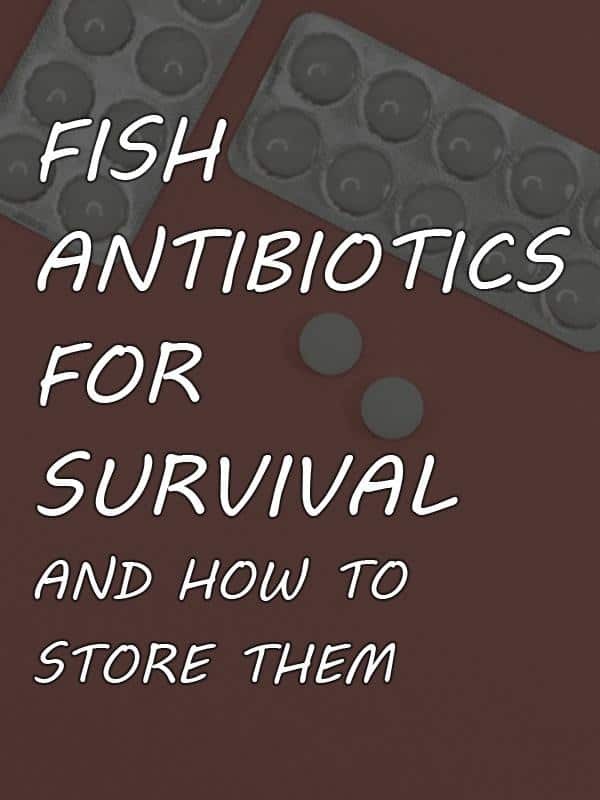 Just like with canned goods and other foods, rotate your stockpile of fish antibiotics so you are using the oldest medications first and leaving the fresher ones in storage. If your antibiotics get too cold or too hot even for just one day, you have to assume the shelf life and potency has been compromised. Most liquid medications require refrigeration and should not be used beyond their expiration date. Even human antibiotics are nothing to mess around with if you don’t need to folks. You can build a resistance to any antibiotic if you don’t use them correctly. If you don’t take antibiotics long enough to completely eradicate an infection or if you don’t take the right antibiotic for what ails you (which you can’t know 100% without lab tests), it can do more harm than good. So, this post should NOT be taken as a recommendation for anyone to just go out and start taking fish antibiotics. I’m also not advocating the use of fish antibiotics in place of professional medical attention. But the fact is there will be some illnesses and diseases that will need antibiotic treatment post-SHTF. Herbal and natural remedies will work for lots of things and they are safer to use but they won’t work for everything. This is simply the sharing of what worked for me one time and what I plan to have on hand as a last resort option in a survival situation. Also, at the time when I tried fish antibiotics, I had no health issues other than the tooth pain. I was taking no other medications, prescription or over the counter. And I knew if something went wrong, professional medical attention was available. Do your own thorough research of whatever you decide to try. Always go with natural remedies first if you can. Consult your physician whenever possible before starting any new treatment or discontinuing any current treatments. You never know when medications will interact. Don’t believe everything you read on a company website and try to get first-hand testimonials or even call the manufacturer to ask questions. Here’s hoping I won’t ever need fish antibiotics again. But I feel more confident having a last resort option on hand if needed. Have you tried any fish or animal antibiotics? We’d love to hear your own first-hand experiences. The information in this article is provided “as is” and should not be mistaken for or be a substitute for medical advice. Always consult your physician before trying any of the advice presented on this page. Consult your physician before taking or stockpiling fish antibiotics. Neither the author nor www.SurvivalSullivan.com or the company behind the website shall be held liable for any negative effects of you putting into practice the information in this article. I was very interested in reading this information as the idea of what would I do should a situation that required antibiotics occurred during a SHTF scenario as well. Can you let me know what company you purchased the fish antibiotics from? As, reading further I was concerned when I read how some companies may use corn starch ingredients and since the company you used seems to be legitimate, I would like to use them as well. Thank you so very much! This is a totally new subject for me but I really agree that sometimes my herbals either take way to long- or just dont do the trick. I will begin researching. Is there a particular site or author you would recommend for someone just starting? Thomas Labs are the only antibiotics safe for humans, you can buy them online from Walmart. Amazon and eBay have banned the sale. They come from the same factory as human antibiotics and have the same markings. Go online to drug identifyer and print the instructions and store them together. Don’t wait the window is closing. I have also used Thomas Labs for my purchases and used the products with good results. I recommend them wholeheartedly. Where do you get the antibiotic tested? I’m sure it is some type of lab but I have never seen an advertisement for “drug quality testing done here”. uh huh ok…analyzed, got it.. I have no job, no insurance and got pinkeye on a Friday night. Urgent care prices – no thanks. I dug into my fish amoxicillan, took the prescribed human dose for the prescribed time. It took care of the problem entirely. That was 6 months ago. I also tried this experiment knowing there was medical help available if I needed it. I am so glad I did! So, Megan; did you ever go to the dentist? The ONE antibiotic you mentioned cephalexin I am terribly allergic to. stomach cramps, vomiting and loose bowls. Terrible. First time didnt know it. Second time, a doctors office did not check my chart for allergies and prescribed it. Had no though about it until the same symptoms started. Then looked at prescription…CEPHALEXJN!!! Was so weak i could not get back in bed from adult potty chair and had to b e cleaned up like a baby. Was I lucky I had someone here to help. I’ve been taking this “horse linament,” internally, for more than ten, (10) years. I will not bore you with my “clinical studies” to determine efficacy of this substance, but I will say, with all candor, that it WORKS! In my case, miraculously. Just be certain, should you choose to use this substance, that all directions on the above website are meticulously followed. The website will explain, much better than I can. I have bought some fish antibiotics for the same reason as stated in the author’s article. But I haven’t used my antibiotics yet. However, since the reason the author used her antibiotics was a tooth problem, I thought I’d share my experience. I have cured tooth infections, including once when pain was severe (obviously a nerve was being aggravated). Tooth infections and gun problems can be cured using garlic. However, it takes a lot of garlic, which I administered by garlic tablets which I had purchased. I realized that taking large doses of anything is often unaffective as the body can absorb only so much at a time and the rest is wasted. So I took 1-2 mgs every two to three hours during my waking hours and just before bedtime. Symptoms were markedly less the next day and completely gone on the second day. I have used this cure more than once and it works for me. I Used Outdated (Prescription) Pharmacy & Fish Antibiotics on Different Occasions For Different Reasons Over A 25YR. Period & Had EXCELLENT Results ; Made Me Think ; Yeah , All Is Not As Advertised Or Commonly Believed Or Understood . Lots Of “MISINFORMATION” Out There .